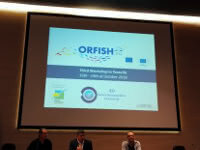 All the partners of the ORFISH project met in Brussels, for the last workshop (9th to 11th of April 2019). On tuesday, presentations of the results, lots of debates and discussions on the work of last monthes. On wednesday, meetings on fishing experimentation results, MFAD monitorisation and preparation of our public conference in the #EuropeanParliament. The 2018's year of the ORFISH project ended in the best possible way: the MFAD in Madeira has been launched into the water on the 27th of December! The first monitoring sessions will start by the end of February, when the tuna season will start again! Thanks a lot to our partners from Madeira! 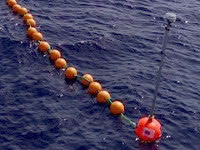 For more pictures, videos and if you never saw how looks like a Moored Fish Aggregating Device (MFAD), please visit this page. 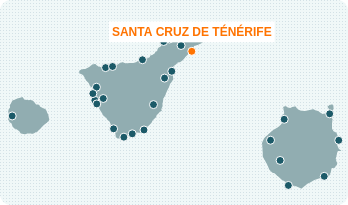 The workshop was held at the Instituto Español de Oceanografía, Tenerife (Canaries Islands), from the 16th to the 19th of October 2018. This workshop was focused on the activities of its Work Packages 3 and 4. The WP3 is dedicated to developing and testing low-impact fishing techniques adapted to the biogeographical conditions of each ORs. The WP4 is dedicated to creating alternative sustainable fishing opportunities. This workshop also concluded the WP2 that looked at collecting data on fisheries in the ORs on socioeconomic issues, on potential user conflicts at sea and on experimental fisheries. 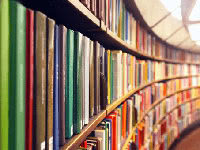 The Library, an open repository of free documents on small-scale fisheries. 64 documents are available, in english, portugues, spanish and french. Interested in the evolution of the management of fisheries with regard to conservation of biodiversity in the Canary Sea? 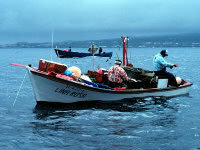 Or by the strategic measures for the fisheries sector of the Azores? The paleobotany of Madeira? In July, Nicolas Diaz expert on MFAD from the Region of Guadeloupe, and Léa Lebechnech from Vertigo Lab, went to the Azores in order to support the building of the MFAD and the workshops organised in parallel. The Archipelago has been made available to the ORFISH project for the realisation of the mooring of the MFAD. In few hours, the operation was well completed, and the MFAD perfectly moored. 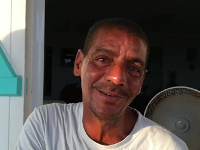 The Testimonials module gathers interviews of fishermen of Outermost Regions. Florencio (Azores), Felix (Guadeloupe) and Filipe (Madeira) will tell you everything you want to know about fisheries. Luís Rodrigues, Regional Fisheries Director and Gui Menezes, Regional Secretary of the Sea (Government of the Azores) also shared their ideas about fishing in Outermost Regions. 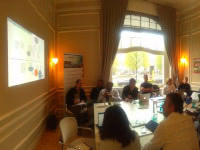 The second ORFISH workshop was held on the island of Sao Miguel in the Azores on 19 and 20th of march. The key objectives of this workshop was to compile all collected data on fisheries within the territories, and to exchange on the outcomes of the compilation of experimental fishing undertaken over the past decades. The ORFISH project attended the socio-economic forum (Terceira Island, 22 and 23th of march). More information in the Azorean Journal [portuguese]. A trip to the ORFISH MFAD of Azores? 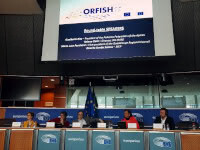 The ORFISH project aims at providing a platform for exchange of knowledge on low-impact offshore fishing techniques among fishers from the outermost regions. The project pursues three main objectives: developing and optimizing fishing techniques in order to alleviate fishing pressure on coastal fish resources; raising awareness of the opportunities to develop innovative low-impact fishing techniques for small-scale fisheries; and creating alternative sustainable fishing opportunities that will help consolidate jobs in the fishing industry. The ORFISH partners come from French, Portuguese and Spanish outermost regions. 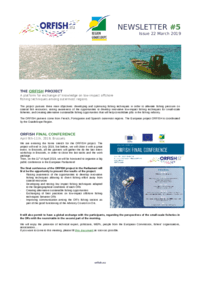 The project ORFISH is coordinated by the Guadeloupe Region.